Recorded Live in Transylvania Studios. 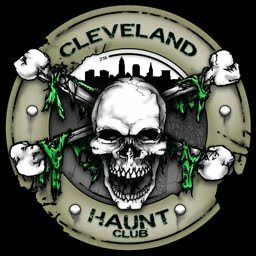 Take a trip through the haunted house if you dare! Turn your home into a scarry (sic), chilling, fearful domain of monsters, ghosts and goblins. This week's Freebie Friday soundtrack is a vintage classic from 1985. 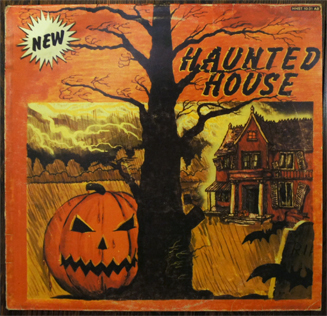 (Chilling, Thrilling Sounds of the) Haunted House, from Haunted House Music Co. (no, not the classic Disney release by the same title) is an accompanying Halloween soundtrack to Night In A Graveyard, another low-budget-but-wonderfully-campy release from the same year. And more great sleeve art with that classic, creepy vintage illustrated style! Side one takes us on a 15 minute trip through a haunted house with the usual, vintage spooky sounds. 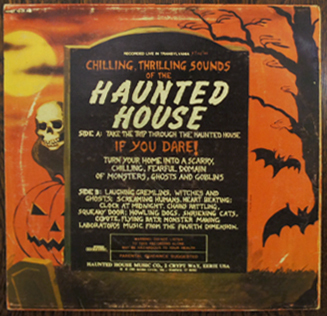 Side two is a separated collection of various spooky sound effects. 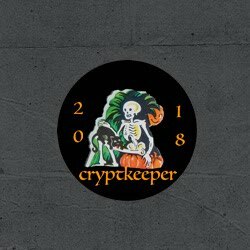 Apparently, this label had a third release entitled, The Ride of the Headless Horseman put out the same year, although I do not have that one to share yet. And yes, although this release had been shared years ago by Scar Stuff, Cult of the Great Pumpkin and Mostly Ghostly Music Sharing BLAAAHHHHGGG!, the great campy factor of this record is just too much fun not to share again. Warning: Do not listen to this recording alone. Siouxsie and the Banshees - "Spellbound"
M.F. Jørg - "Death Experience"
Marcel Bontempi - "Old Mad Witch"
Dave Gardner - "Mad Witch"